At only 13 pages long, the story is short and sweet, but plenty adequate for the purposes of telling the whole birth story. It's also a very appropriate length for the toddler and preschool crowd who make up the likely audience. Mikko and I both appreciated the detail it manages to go into in those few pages. He pointed out the umbilical cord, I describe what labor looks and sounds like, and seeing the baby nurse always inspires him to have his own snack. The illustrations are explicit without being disturbing (to me, at least!). I love the touches of mentioning that the mother "stops to move her hips like a bellydancer" during labor and "makes lots of great noises" while pushing " … kind of like an elephant!!!" Yes to both of those from Alrik's birth! Mama, Talk About When Max Was Born is a sweet story that will help you prepare young children for an upcoming birth in your family. The story opens with a little girl asking her mama to tell her the story of the younger brother's birth. The mama narrates the story beginning with the day they found out they were expecting, continuing on through midwife appointments and visits from the doula, preparing for their homebirth, and ultimately having a peaceful home waterbirth. The older sister is involved in every aspect of pregnancy and birth preparations. She is shown participating in midwife appointments (holding a stethoscope, helping the midwife measure mama's belly), assisting with the tasks needed to ready the house for baby (folding cloth diapers), and there is a lovely picture of the sister cuddling her own baby (and perhaps even "nursing" it) while mama labors in the birth pool nearby. The father is also engaged in almost every scene - helping with laundry, setting up the birth pool, and comforting the mama during labor. Every scene of the birth story is gentle and peaceful. It is obvious at the prenatal appointments that the family desires a low-intervention birth - the midwives are not shown using a doppler or other often standard tools. The waterbirth scene includes the mama holding the newborn baby with the umbilical cord still attached. The midwives and doula are present, but the focus is on the mama and baby. In this birth story, the sister is not present for the actual birth. The mama says, "You wanted to play with Nana for awhile. We promised to call you as soon as the baby was born so that you could meet him right away." We are actually planning on having Kieran here with us when we have our homebirth, but we will also have someone on call in case Kieran is uncomfortable during labor or I need more preschooler-free peace and quiet. Kieran has thoroughly enjoyed this book. He has been so excited to get ready for his own new sibling, and this was a very age-appropriate glimpse into another big sibling's life. Kieran has asked me several times to read this book, and he especially loves the last several pages that show the family together after Max is born. Mama, Talk About When Max Was Born was written by Toni Olson and illustrated by S. Marie Carlson. I would recommend this book to any parent preparing a young child for the birth of a sibling - particularly if the birth will take place at home or at a home-like birth center. It would also be a great book to gift an older sibling with who has recently gained a new little brother or sister - it would be helpful for the child to process his or her own experiences. 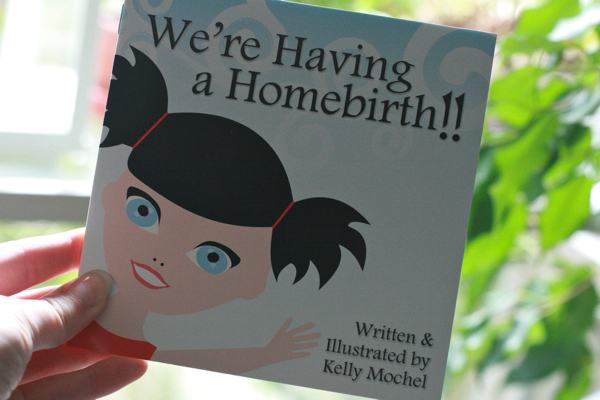 You can purchase your own copy of We're Having a Homebirth!! 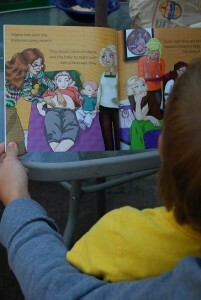 at HomebirthChildrensBook.com. A single copy is $6.50 + $1.50 shipping for Canada and the U.S., $9.50 total elsewhere. Discounted multi-packs start at $32.50 for U.S./Canada for 5 books, or $60 for 10 books. 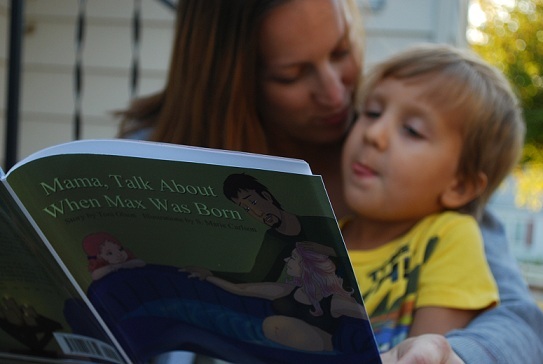 For your own chance to win one of two copies of both Mama, Talk About When Max Was Born and We're Having a Homebirth! !, enter by leaving a comment and using our new Rafflecopter system below. This is a joint giveaway with Hobo Mama, Code Name: Mama, and Natural Parents Network. You may enter at one site only, and we'll be recording IP addresses to ensure that there are no duplicate entries. That said, please do visit and enjoy all three sites! Lauren works and writes at home with her husband and their preschool son, Mikko, and newborn son, Alrik. 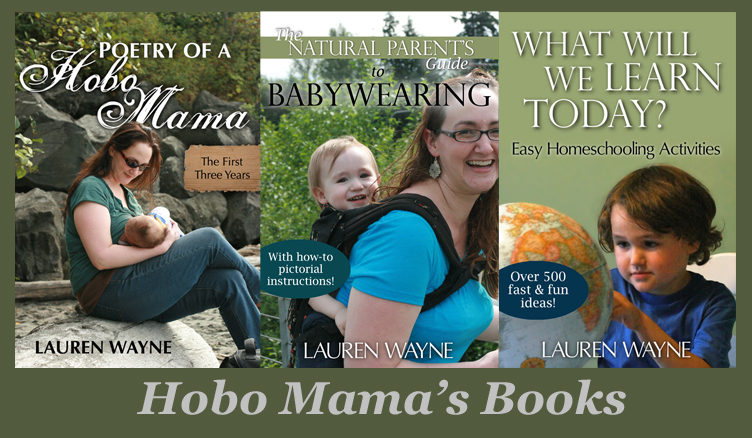 At Hobo Mama, Lauren blogs about natural and attachment parenting, breastfeeding, babywearing, cloth diapering, green living, and more. Lauren offers reviews and giveaways of natural parenting products at Hobo Mama Reviews and gives a behind-the scenes look at blogging and writingn at LaurenWayne.com. Lauren co-hosts the monthly Carnival of Natural Parenting and is the cofounder of Natural Parents Network. I'd love to win these because we're having a homebirth in three months!